The company was founded in 1994 as a limited partnership. After the transformation into a corporation in the year 2002 the stockholders are Clemens Wirth as well as the employees. 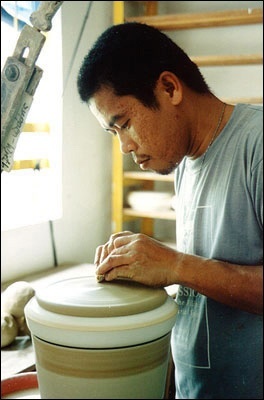 Master Potter Clemens Wirth comes to the Philippines several times a year. 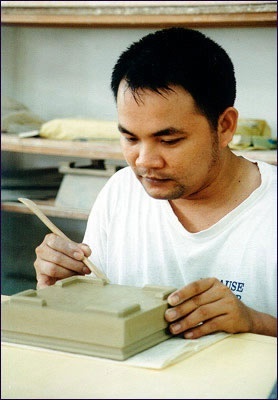 He is in charge of medium and long-term decisions concerning the further development of the enterprise, the development of products and the further training of THE STONEWARE POTTERY, INC. employees in all commercial and technical aspects. 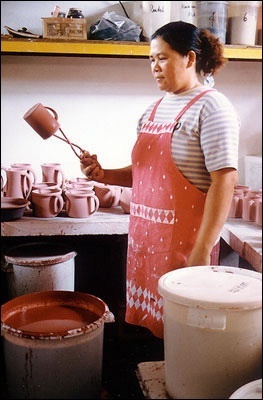 Most of the THE STONEWARE POTTERY, INC. employees come from a traditional family of potters and already started working with clay in their childhood. 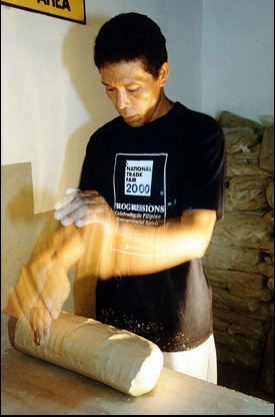 The first step of the production is giving optimal plasticity to the clay by kneading it intensively -- the first but necessary step to achieve a good product on the potter's wheel. 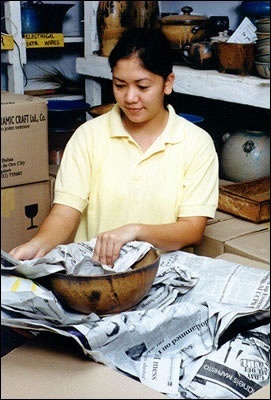 After weighing and portioning the amount of clay used for a specific item, the clay will be put on the potter's wheel and centered - the first step of throwing. 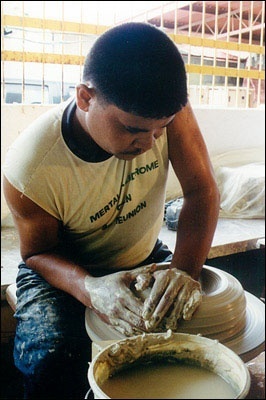 On the potters wheel the items are moulded only with the hands, following a technical sketch. No moulds are used. After the throwing process on the wheel we have the second step: the pots must be dried carefully. They must be "leather hard" before the manufacturing process can go on. In the drying room the throwers are taking care of the vessels -- a job that must be done seven days a week, even on Sundays. Once the items have become leather hard, their bottoms must be trimmed. Trimming gives shape and stability to the bottom which is necessary for everyday use. Special care is given to the edges in order to prevent them from chipping off. Cups, mugs, teapots and many more vessels need handles. This process requires years of experience to be done perfectly. Beside the free forming process on the potters wheel we mould part of our plates by jiggering them: A plastic template is used to mould the clay. This method makes sure that all the plates will be of exactly the same size and shape. This consistency is important for restaurants, hotels or larger households. 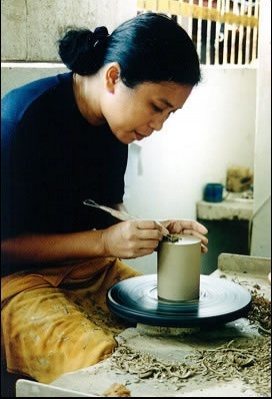 We also produce using the slab method for vases and plates that are not round. The slab method makes it possible for us to produce rectangular baking tins, square vases for bonsai and ikebana, square and recangular plates and many more forms. Company logos can be applied too. They can be neither embossed or incarved. Plates and cups with these kind of logos are often ordered by restaurants, hotels, spas and coffee shops. We can also produce your corporate gifts, wedding give-aways and other items using this technique. 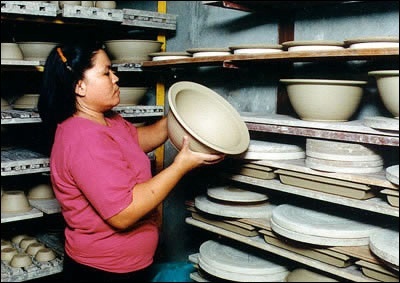 All the clay waste of the throwing and trimming processes is carefully kept, then dried, mixed with water and put back into the manufacturing process. So we don’t have any waste in the production process. Our three LPG-fired kilns are built using progressive materials and technology. Through this we achieve first-class firing results for the production of our high-quality stoneware. Yet, our technique consumes very low energy, cost-effective, and environment-friendly. 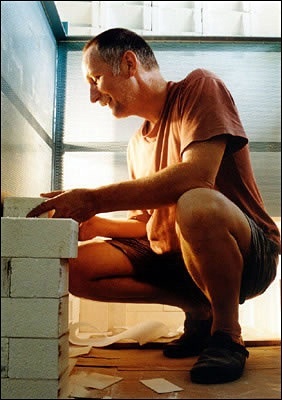 Clemens himself constructs our kilns. The first firing at 940°C is the bisquit firing. Loading, firing and unloading takes 2 days. After the bisquit firing the glaze will be applied. Glaze firing is done at 1220ºC. The whole glaze firing process again takes 2 days. 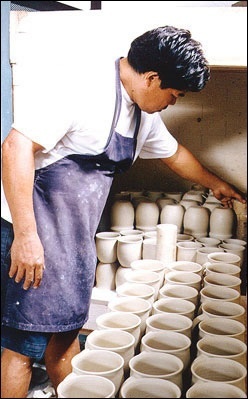 The firing result is controlled immediately after cooling down a glaze firing -- the first part of our quality control. All our glazes are based on mixtures developed by Clemens in more than 30 years of work experience. 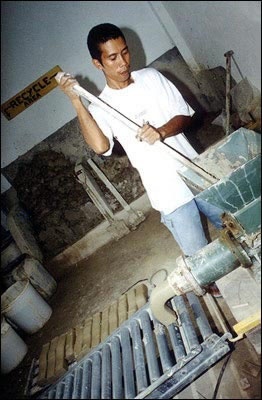 Exactly the same mixtures are used in his pottery in Germany where the Glazes are regularly controlled by authorities. This is why we can guarantee that our glazes do not contain any lead or other ingredients that may be harmful to the health of the user. All our products can be used for cooking, serving or storing food. 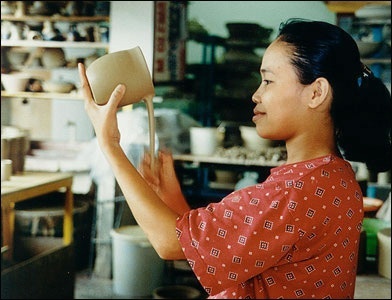 From the work on the potters wheel until the product is finished the whole production process takes 14 to 20 days, depending on the size of the item. Thus the production lead time is 5 weeks for small orders and can increase to 8 to 10 weeks for medium to large orders. As about 90% of our stoneware is shipped, safe packing is very important. We are using newspaper to pack the pottery into cartons. Usually the cartons are properly put into crates, so that they are safely transported by boat, plane or truck all over the Philippines as well as in various parts of the world. We also do special packing required by our customers.